Among Allerona (TR), Acquapendente (VT), Torre Alfina (VT), Proceno (VT) and Trevinano (VT) returns, from March 4th to October 27th, 2012, the nature accompanied trails. Title of this edition: "Il Piacere di Camminare" ("The Pleasure of Walking"). They starts Saturday, March 4th, 2012 at 9:30 am from Piazza Attilio Lupi of Allerona with the Percorso delle Crete (Path of the Crete): Chiusamorra, Fontacce, Casaccia Mancini, Mulinello, Mostarda, Peccio, Allerona. Packed Lunches. Last appointment October 27th, 2012 with the Camminata del "Trasecco" (Walk of "Trasecco") in Trevinano, 12 Km circular. 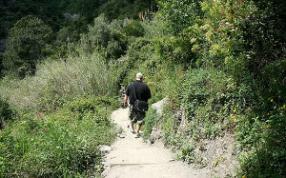 However, the "star" of the paths will be the 28th Scarpinata a Monte Rufeno, from September 28th to 30th, 2012. 3 days, 3 different locations in the "Benedict Triangle of Italian Walkers", that are Allerona, Trevinano and Acquapendente.